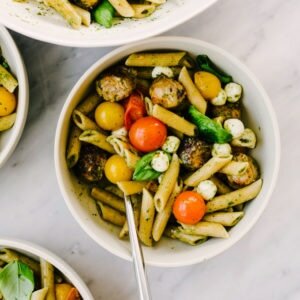 This caprese pasta with whole wheat penne and Italian sausage is a protein packed, lighter take on the classic. It’s packed with a full pound of fresh tomatoes, and just enough pasta to satisfy a craving but still be considered low carb. You’ll love this bright, intensely flavored summer pasta recipe! Caprese is the quintessential summer flavor combo. Juicy, fresh tomatoes. Bright, sweet basil. Briny fresh mozzarella cheese. I’ve yet to encounter a human being who doesn’t dig this combo. Seriously, what’s not to love? While we’re huge pasta fans in this family, I try to keep most recipes on the cleaner side with loads of vegetables and a big punch of protein. 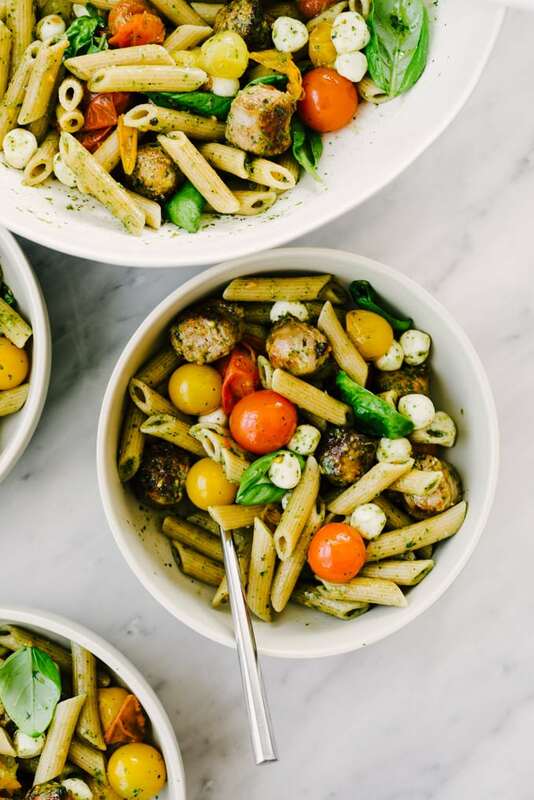 This caprese pasta with Italian sausage does just that. It’s made with a full pound of cherry tomatoes, an equal portion of Italian sausage, scads of basil, and just enough whole wheat pasta to tie it all together. There’s enough pasta in this recipe to satisfy a craving while still eeking out a low carb status (just 29 grams per serving!). 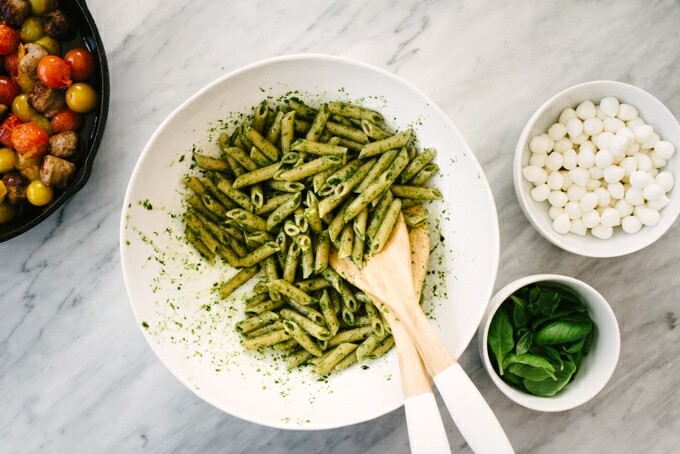 I dress this pasta with a pesto-ish basil sauce – I skip the cheese and nuts to keep the flavor intense and fresh, with the added benefits of being quick, easy, and pretty darn clean. 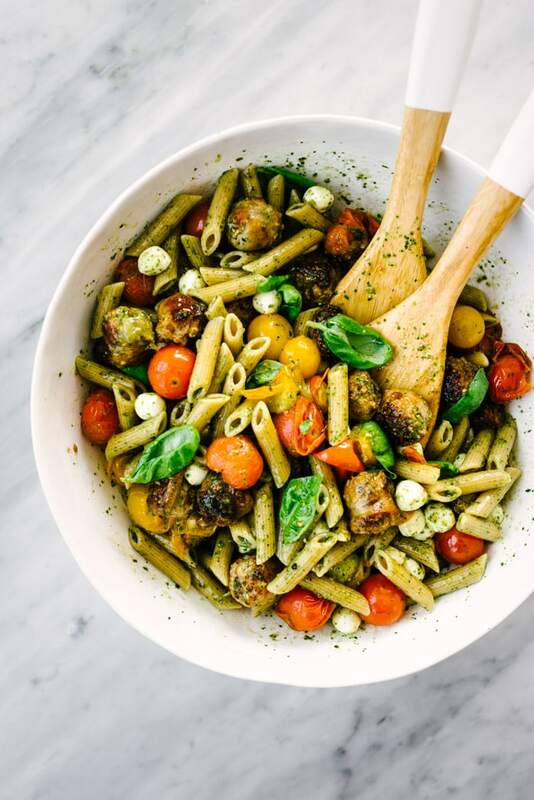 The resulting caprese pasta is bursting with flavor, packed with protein, and ready to rock your dinner in just 30 minutes. Indulgent and nutritious? That’s my kind of dinner pasta. Love it? Pin it! Click here to save this Caprese Pasta to your recipes board on Pinterest. This recipe comes together in just about 30 minutes, so it’s perfect for those hectic nights when you need a healthy dinner stat and don’t really want to think about how to get there. Get your pasta water started, and be sure to thoroughly season the water. It should be as salty as the sea. While the water is coming to a boil, get started on the protein and veggies. Heat a 10″ skillet over medium high heat and add the Italian sausage. 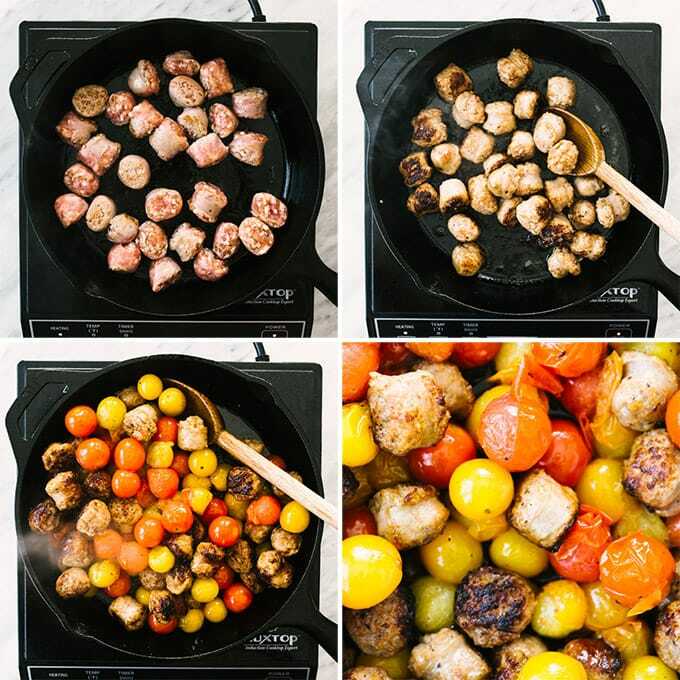 Saute until the sausage is cooked through, and then add the tomatoes to the skillet. Cook the tomatoes with the sausage until they start to burst (it only takes a few minutes), then remove from heat. While the pasta is cooking, prepare the sauce. In a small blender or food processor, blend a couple cups of fresh basil leaves with some garlic, salt, pepper, and olive oil. The texture will be somewhere in between salad dressing and pesto. Then add the mozzarella cheese, cooked sausage, and burst tomatoes. Use a slotted spoon to transfer the sausage and tomatoes from the skillet to the pasta bowl to drain the residual fat and juices. Add another handful or two of fresh basil, and then toss it all together. This recipe makes four generous portions that will leave you feeling full but not stuffed. Pasta perfection. This recipe is best enjoyed fresh, and doesn’t reheat super well. Leftovers aren’t recommended, but I don’t think that will be an issue. Season the pasta water liberally with sea or kosher salt. It should taste like ocean water. This will help season your pasta from within. Use kitchen shears to cut the Italian sausage into coins – it makes the process super easy! Italian-style chicken sausage works great in this recipe for an even cleaner take. Any short pasta variety will work in this recipe – rotini, rigatoni, farfalle, orecchiette, etc. If you’re not a fan of whole wheat pasta or have never tried it, this is an excellent recipe to give it a try. The nutty flavor works pairs well with the fresh, intense flavors. Small fresh mozzarella pearls are my first pick because there’s no prep. Huzzah! If you can’t find them, use bocconcini and slice in half, or a whole fresh mozzarella ball and dice into 1/2″ cubes. Feel free to use your favorite jarred pesto (I love the Trader Joe’s brand of basil pesto! ), but know the nutrition count below will be inaccurate. If using jarred pesto, be sure to remember to add fresh basil to keep the flavor bright. PIN IT NOW, MAKE IT LATER! 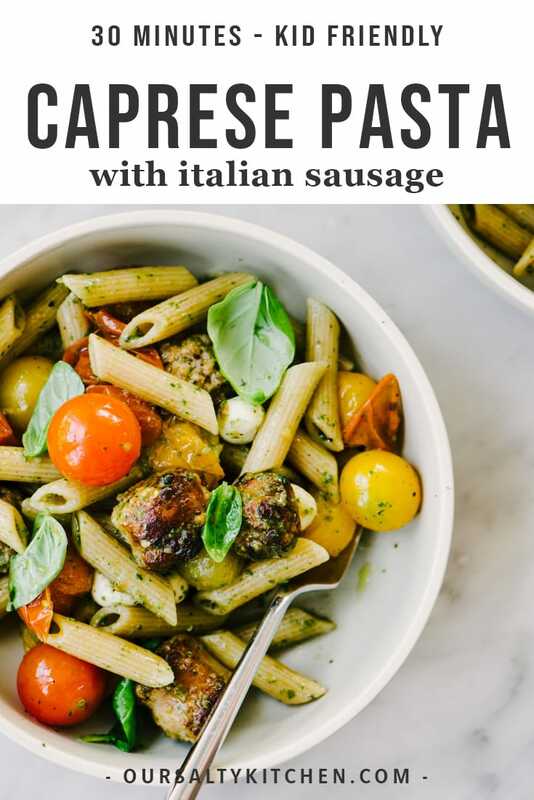 CLICK HERE TO PIN THIS RECIPE FOR LOW CARB CAPRESE PASTA WITH ITALIAN SAUSAGE! 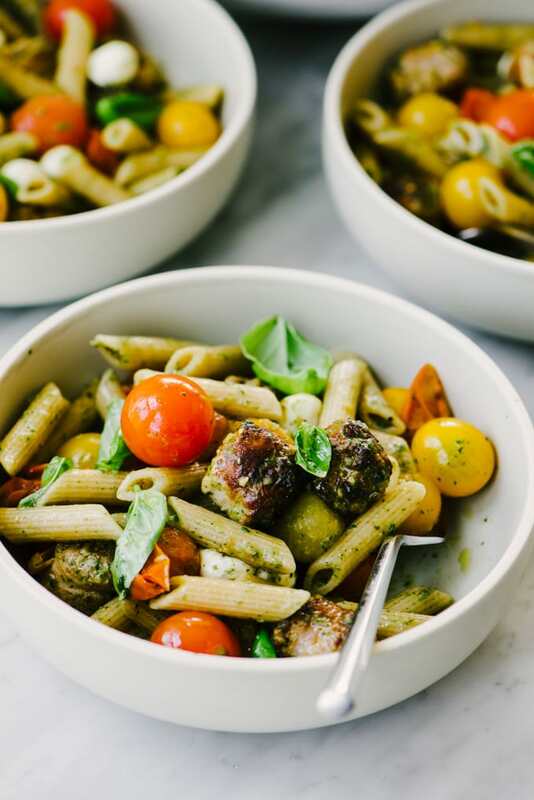 This caprese pasta with whole wheat penne and Italian sausage is a protein packed, lighter take on the classic. It's packed with a full pound of fresh tomatoes, and just enough pasta to satisfy a craving but still be considered low carb. You'll love this bright, intensely flavored summer pasta recipe! Fill a large pot with four quarts of water and bring to a boil over high heat. Add at least one tablespoon of salt. Once the water comes to a boil, add the pasta and cook according to package directions. Drain well and set aside. While the pasta is cooking, prepare the sausage and tomatoes. Heat a 10" skillet over medium high heat. Add sausage and saute, stirring occasionally, until cooked through, 7-9 minutes. Add the whole cherry tomatoes and saute, stirring continuously, until cracks begin to appear in the skins, about 3 minutes. Remove the sausage and tomatoes from heat and set aside. 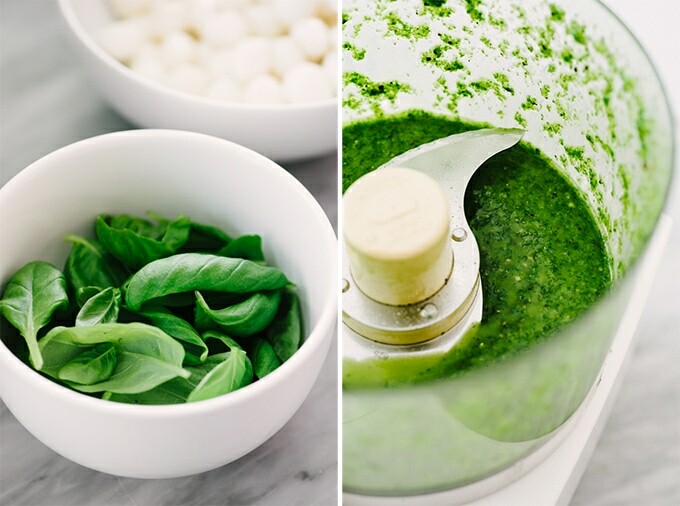 Place two cups of basil into the bowl of a food processor and add the garlic, salt, pepper, and olive oil. Flip the motor on and puree into a sauce. Toss the cooked pasta with the basil sauce, then add the fresh mozzarella. 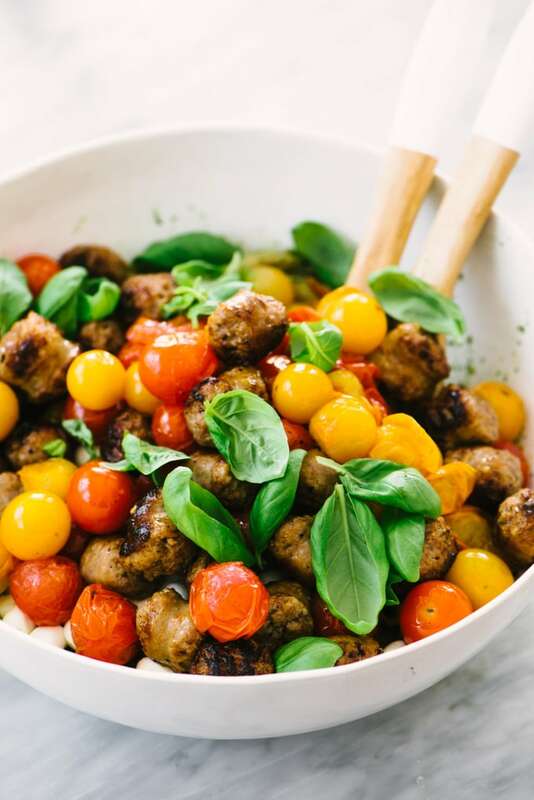 Using a slotted spoon, transfer the cooked Italian sausage and burst tomatoes to the pasta bowl, then top with the reserved half cup of basil. Gently toss the ingredients together. Divide the pasta evenly between four bowls and serve immediately.